The AcceleGlove records the movements of your hands and fingers while you are wearing it. It is an open-source device that costs just $499. Maryland-based AnthroTronix developed it for the DoD; you can program it with Java. An accelerometer rests just below each fingertip and on the back of the hand. When the user's hand moves, the accelerometers can detect the three- dimensional orientation of the fingers and palm with respect to Earth's gravity. 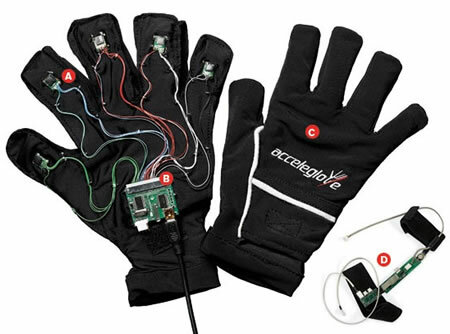 The accelerometers feed the position information through lightweight copper wires to a printed circuit board, which sits on the back of the hand... the board transmits the data to a computer through a USB cord plugged in under a flap on top of the glove's wrist. Made of a breathable nylon mix that can stretch to fit hands of different sizes, the glove features open fingertips so a user can type or write while wearing it. The glove can track the movement of the user's arm through an optional component. The arm link consists of two pieces of stretchy fabric, connected by a thin microcontroller, that wrap below the elbow and around the biceps. A potentiometer measures how the elbow flexes, and an accelerometer in the band around the biceps measures the rotation of the arm. The raw data from the glove can be used to define any sort of gestures that are desired for an application; programs like Mathematica can be used to analyze data streams. SF fans can now have Tom Cruise's gloves from the 2002 movie Minority Report. His character makes use of special wired gloves; the lit fingertips (and thumb tip) are sensed by the display, which follows his commands. It's a different technology, but achieves similar results. Watch two videos comparing the real AcceleGlove with the fictional Minority Report-style glove. From MIT's Technology Review. 'The subvocal read nerve signals, letting her enter words by just beginning to will them...' - David Brin, 1990. 'He pressed hard with his tongue against his right upper first molar. '- Alfred Bester, 1956. Nifty input technology takes advantage of your biggest organ to provide you with easy input. This device was developed at great expense by your government, and now you can have one at a very reasonable price; developers use Java to program it.